I’ve been warning bears for a couple of weeks that the market was due for an aggressive bear market rally. That rally has clearly begun. I have often referenced the Rubber Band theory in my nightly reports. For those not in the know the rubber band theory is nothing more than the tendency for any market to regress to the mean. And the further a market is stretched away from the mean the more violent the snap back tends to be once the pressure is released. In the case of a rubber band, the further you stretch it in one direction, the harder it snaps forward once you release it. Simple action and reaction. Markets are really no different than a rubber band. The further you stretch the stock market the more violent and persistent the snap back tends to be once the turn occurs. At the recent yearly cycle low on August 9 the stock market had stretched to ridiculous levels, both sentiment wise and technically. This should generate an extremely convincing bear market rally. A normal bear market rally will typically last from 4 to 10 weeks. (They have to last long enough to reverse extreme sentiment levels.) Generally speaking that takes a minimum of 4 weeks, and 6-8 weeks is about average. A bear market rally out of a yearly cycle low (other than a four year cycle low, the move into a yearly cycle low tends to be the most damaging decline in the stock market. This year was certainly no exception) will quite often tag, and occasionally penetrate the declining 200 day moving average. I tend to think that will be the case this time also. My best guess is the market will rally up to the 200 day moving average, then dip slightly into the next daily cycle low around the end of September. That should be followed by an extreme left translated daily cycle that tops slightly above the 200 day moving average (I guessed at about 1300 on the chart below) and then moves down into the next intermediate bottom due in late November or very early December. At which point the market will make a lower low, confirming a new cyclical bear market. Actually the market has already met all three confirmations that a new cyclical bear market has begun. 1. Dow theory sell signal. When the industrials and the transports both broke below the March low a Dow theory sell signal was triggered. 2. A move below a previous intermediate bottom. 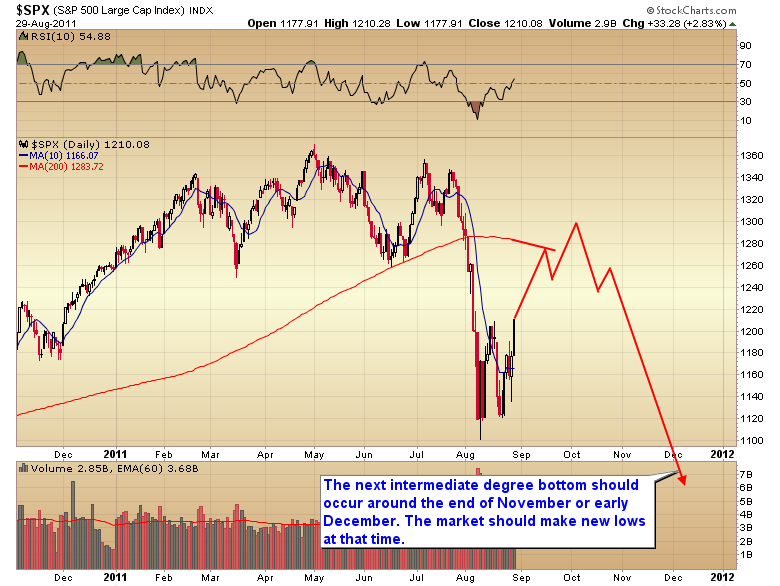 When the S&P broke below the March low it triggered a new pattern of lower lows and lower highs. 3. 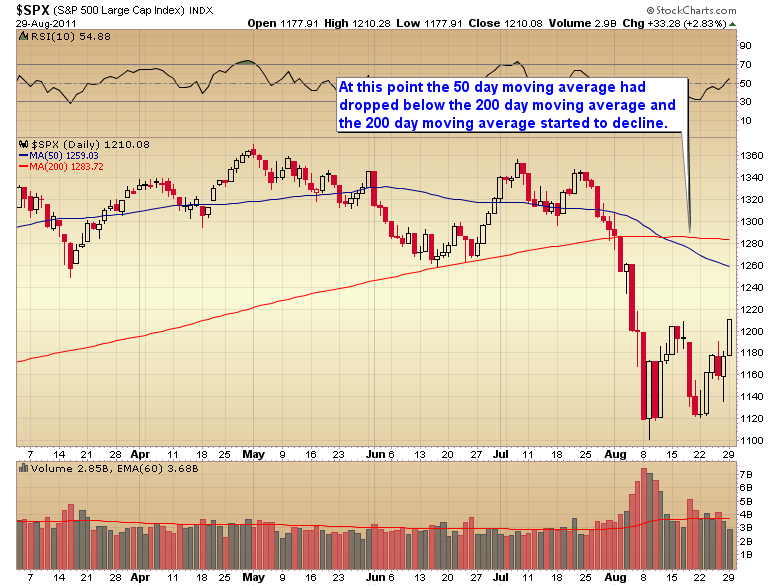 The 50 day moving average dropping below the 200 day moving average, and the 200 day moving average turning down. Investors need to be prepared. This is going to be a very, very convincing rally. The tendency is going to be to buy into the media hype, that this was nothing more than a severe correction in an ongoing bull market. This was not a correction. 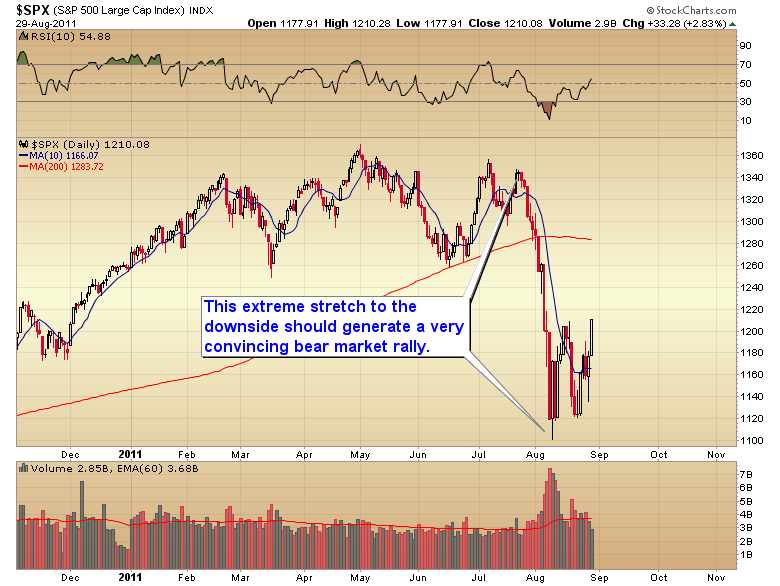 This was the first leg down in a new cyclical bear market. And like all bear markets it will be subject to violent countertrend rallies that toy with traders emotions, and ultimately cause investors to ride the bear all the way to the bottom. This entry was posted in Uncategorized on August 29, 2011 by Gary. This entry was posted in Uncategorized on August 26, 2011 by Gary. That portfolio change has been made on the website. This entry was posted in Uncategorized on August 25, 2011 by Gary. A portfolio change has been made to the model portfolio. This entry was posted in Uncategorized on August 24, 2011 by Gary. As I have been warning investors for many months, stocks have now entered stage III of the secular bear market. Gold on the other hand is now in the final parabolic phase of a 2 1/2 year C wave advance. My best guess was that we would see a Dow:gold ratio of between 5-6 before this C wave ended. The ratio was at 5.71 as of today. For reasons explained in the nightly reports I think we may still have a little further to go on the downside for stocks and a little further upside in gold. So it’s entirely possible that we could see a Dow gold ratio of 1:5 before the trends reverse. However the low risk, large potential trade is now in the stock market, not playing chicken with the gold parabola (also explained in the nightly newsletter). Cyclically the stock market is now in the middle of the timing band for an intermediate bottom. Presumably a sharp bear market rally in stocks will trigger a regression to the mean, profit-taking event in the precious metals market (the D-wave). D-Wave’s almost always test, and sometimes marginally penetrate the 200 day moving average. I’ve illustrated in the chart above a rough guess as to where I expect the countertrend rally in stocks and the D-Wave correction in gold to retrace. 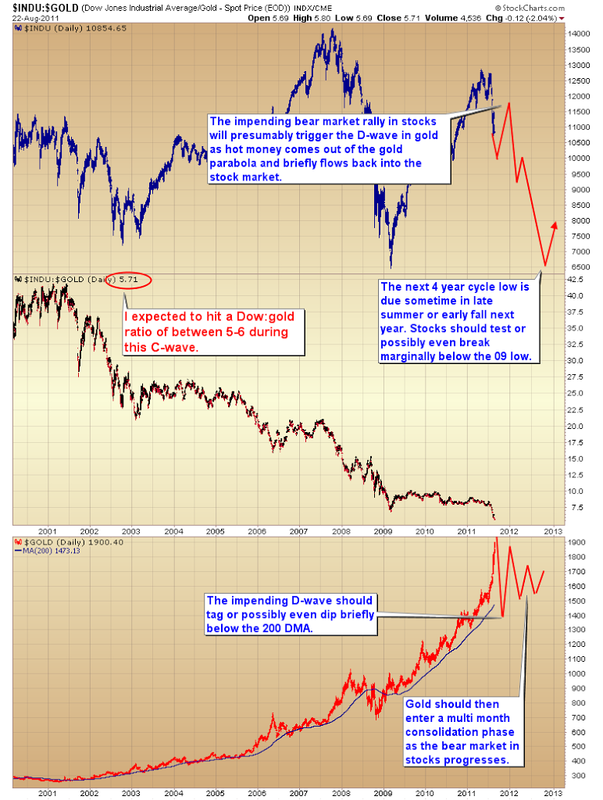 Keep in mind that the fundamentals for gold have not changed. A D-Wave is simply a profit-taking event triggered by an unsustainable parabolic rally. It has nothing to do with fundamentals. Once the D-Wave has run its course gold will enter a sharp snapback rally (the A-wave), after which it should consolidate for the remainder of the bear market in stocks. Stocks on the other hand, after what should be a very convincing bear market rally, will roll over and continue down into a final four year cycle low, probably in the late summer or early fall of 2012. Depending on whether or not the Fed tries to fight the cleansing process stocks should either test the March 09 lows, or if Bernanke tries to stop the bear market with another round of quantitative easing, we could see the March 09 lows breached. Either way I expect that 2012 will go down as one of the worst years in human history. Certainly in the same category as 1932 if not worse. This entry was posted in Uncategorized on August 23, 2011 by Gary. A portfolio change as been posted to the website. This entry was posted in Uncategorized on August 19, 2011 by Gary. This entry was posted in Uncategorized on August 18, 2011 by Gary. This entry was posted in Uncategorized on August 17, 2011 by Gary.